Mega Sale! Save 22% on the The Hunger Games 4-Film Collection (The Hunger Games /The Hunger Games: Catching Fire /The Hunger Games: Mockingjay Part 1/The Hunger Games: Mockingjay Part 2) Blu-ray/Dvd by at Epic Movie. Hurry! Limited time offer. Offer valid only while supplies last. The Hunger Games 4 - Film Collection. Each Film has it's own case.Featuring: The Hunger Games Blu-ray/Dvd. Also includes metal Mockingjay Pendant. The Hunger Games 4 - Film Collection. Each Film has it's own case.Featuring: The Hunger Games Blu-ray/Dvd. Also includes metal Mockingjay Pendant. Note: This is a 3-Disc Set. Disc 1 (Blu-ray): Feature Film Disc 2 (Blu-ray) Special Features include: Game Maker: Suzanne Collins and the Hunger Games Phenomenon, The World is Watching: Making the Hunger Games, Letters from the Rose Garden, Controlling the Games, A Conversation with Gary Ross and Elvis Mitchell, Preparing for The Games: A Director's Process (Blu-ray Exclusive), Propaganda Film, Marketing Archive. Disc 3 (Dvd): Feature Film. Also includes Slip-cover. The Hunger Games: Catching Fire Blu-ray. Also includes Slip-cover. Special Features include: Filmmaker Commentary, Deleted Scenes, 9-Part Making-Of Documentary, Divergent Sneak Peek. The Hunger Games: Mockingjay Part 1 Blu-ray/Dvd. 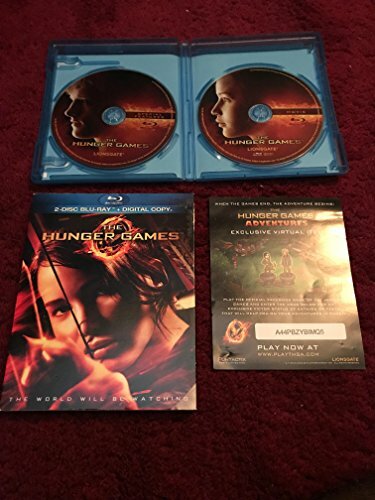 Special Features include: Deleted Scenes, Audio Commentary With Director Francis Lawrence & Producer Nina Jacobson, The Mockingjay Lives:The Making Of MJ1 Documentary, Straight From The Heart: A Tribute To Phillip Seymour Hoffman, Songs Of Rebellion: Lorde On Curating The Soundtrack, Lorde 'Yellow Flicker Beat' Music Video, Insurgent Sneak Peek. The Hunger Games: Mockingjay Part 2 Blu-ray/Dvd. Special Features include: The Hunger Games: A Photographic Journey, Audio Commentary With Director Francis Lawrence & Producer Nina Jacobson, 'Pawns No More: Making The Hunger Games: Mockingjay Part 2 - An 8-Part Documentary With An In-depth Look At All The Aspects Of The Making Of The Final Movie, Panem On Display: The Hunger Games: The Exhibition, Jet To The Set, Cinna's Sketchbook: Secrets Of The Mockingjay Armor. Also includes Slip-cover.